I know I said that this was a 2 part post, but hell, it's my blog so I can change my mind if I want. Actually due to The Irredeemable Shag (from The Fire and Water Podcast and Firestorm Fan that I've mentioned previously in my blogs), I decided to add this third part. He's recently released a new podcast reviewing the old DC Heroes roleplaying game (see: http://firestormfan.com/2013/09/09/hero-points-01/ ) which made me fondly remember my role-playing days. So I decided to share my Role-playing origins and backgrounds. First, for those that are looking at me puzzled, let me briefly explain role-playing games. Role-playing games are when a bunch of friends get together to play a "board game". Except there's no board. All you need for role-playing is some paper, pens or pencils, dice and the most important thing... Imagination! Keep in mind that during this post, I'm referring to what's known as tabletop role-playing, compared to the other type of role-playing, what's known as LARP (Live Action Role Playing). In LARP, you actually get up and act out parts. More like drama class for you and your friends (keeping in mind that I've never done any actual LARPing, cuz I'm too damn lazy. 8) ehehehh). 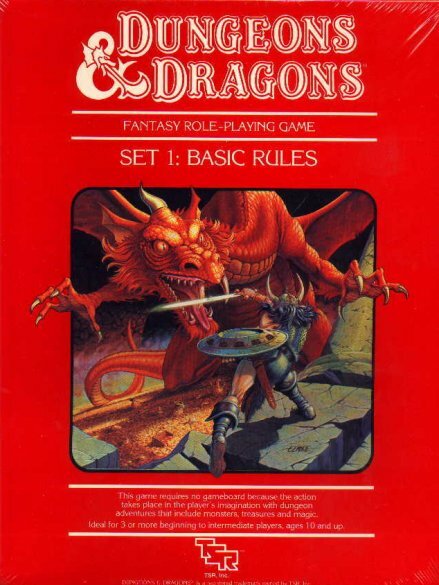 The most popular and well known role-playing game would have to be Dungeons and Dragons (also known as D&D). Dungeons and Dragons came in to being, back in 1974. For more information on D&D, check out the Wikipage for D&D. But I digress.... let's get back to my discussion of role-playing and role-playing games. 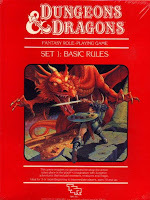 As with most of the world, my first introduction to role-playing was indeed D&D. I first remember it when I was in 6th or 7th grade. Some of the "nerds" at my Jr. High would sit around under the trees on the benches playing it. There was a group of 5 of them. It seemed interesting and I always wanted to learn to play, but I wasn't "smart" enough or "geeky" enough to join them. So my mom ended up getting me the basic set (I believe it was the 1983 Basic set) and a copy of some of the other books (like Monster Manual, the DM Guide, and Players Guide). Me and my friends started playing a little D&D here and there. Also, in 1983/84 when I was in 8th grade, I had two periods of English (it may have been English/Reading or something). I was doing so well in the class (my Reading scores tested first or second year college level at this point), that my mother (who was the Teacher's Aide for the Special Ed class) talked to my English teacher (Mr. Bean) about me coming to her classroom for one period so I can do a little D&D role-playing with some of her students (as a reward for when they did well). After that I played D&D more and more infrequently (mostly as most of my friends weren't just that in to it). At the tail end of 1984, beginning of 1985, me and my best friend (Dean Cole) created our own role-playing game. The Adventures of Breakin' and Poppin'. Yes, we created a role-playing game where you could be a break dancer (as we were both in to rap music at the time and Dee would do some breakin' and poppin' ). Sadly, as a rotund, uncoordinated, young man, I couldn't break nor pop very well. But with this game, I finally could! For awhile after that (the next year or two), me and my friends would play this game. It may be my faulty memory or simple nostalgia, but I seemed to remember really enjoying this game. Me and Dean had typed the game up on a typewriter I had got for Christmas in 1984. We made our own rules (based loosely on D&D's rules), characters, equipment, and a list of moves you could use. We even created a mini-adventure. LOL... looking back I remember that game very fondly. That was fun times. I wish I could find one of my copies of it. Eventually that game was left by the way side. For the next few years I didn't do much role-playing. Read my comics, did a little rapping, and lived my life. Then in the late 80's (I forget when exactly), I was at my LCS (local comicbook shop) (Cop-A-Comics in Merced, CA (which I mentioned in an earlier post)). On the wall he had DC Heroes 1st Edition (the Titanscentric box edition). Remembering D&D and how fun it was, I had to buy it. Again, while I didn't have people to play with, it still excited me to have it. My next foray in to role-playing, didn't go very far. In 1989, I moved to Merced with some friends (Dean (which I've mentioned previously), Ray Hatley, and Jake Miller). While living up there, somewhere (may have been at Hobby Castle which used to be in Merced), I found a posting on a bulletin board about RPers looking for more players. I gave them a call and one afternoon, I rode my bike to Atwater (about 5-10 miles away). There I created a character for a role-playing game called Champions. By the time we were all done creating characters, it was late, so we called it a night. Due to my work schedule and it being so far away, I never got back over to play any more (told you, it didn't go very far). In mid 1990, I found myself back in Chowchilla, living with some friends (one of them being Dean again). One of our friends that was ALWAYS hanging out at our house (Bop aka Billy Tevnan), was also in to comics. So one day I pulled my DC role-playing game and talked several of them in to playing with me. Also somewhere along the way (I forget where and when) I also ended up with the Batman Roleplaying Game, the 2nd edition of the DC RPG and some supplemental material. So, for the next year or two (until we all moved out), every so often, we'd get together and play superheroes (this was until about late 91, early 92 or so). One of the best subplots we had that I remember to this day was when Dean approached me about doing a subplot where his character is kidnapped and replaced with a Durlan (an alien shapeshifter). So we ran that subplot and for the next (I think) couple of months, Dean played his character as a Durlan impersonating his character (if I recall correctly his character's name was Sampson aka Dave Glass). Then around 1993 (or so), I met a guy who became one of my best friends and brought me back in to role-playing. His name is Scott Kessler. We met at our local comic shop. We met when we were both in the store buying our books. I was talking to Lonnie (the owner) about a rumor I had heard that he was closing up shop. He assured me that the rumors weren't true and he wasn't closing anytime soon (and he was around for the next 15 years or so until him and his wife passed away). When I left the store, I decided to walk down Main St to meet up with where my wife (well, now my ex-wife) was at. At the same time, Scott was leaving. We happened to be walking the same way, so we started talking. Scott told me that he had heard the same rumor, and he too was glad that it wasn't true. We talked about a bit comics, then the subject of role-playing came up. He mentioned that him and his friend do some role-playing and that I should join them. So we got together (me, Scott and his friend Terry Richards) and started roleplaying (which we did almost once a week for like the next 5 years or so). We played until Scott and Terry ended up moving away. Hong Kong Action Theatre (my buddy Scott actually wrote and had some material published for this game). Conspiracy X (an X-Files type game). And that basically ended my role-playing (more or less). Me and some friends started to play D&D, but a couple of the guys moved away after one or two sessions. My son's friend came over and we played a White Wolf game one time (I think it was Hunter: The Reckoning). And that's basically it. I'm hoping at some point to do some more role-playing.... We'll have to wait and see. Well, that should do it for Part Three of my Geek Credentials. I hope you enjoyed reading my history. "Roll the dice to see if I'm getting drunk!" "Okay, but if there's are any girls there, I wanna DO them!"